There is a very clear theme running through our reporting of Beuno’s wells and I risk becoming very repetitive. The last one we saw, at Aberffraw, had disappeared under a road scheme, and with the exception of that spectacular well at Clynnog Fawr, just up the road from Penmorfa, none of the others have fared much better. Where perhaps Beuno loses out in quality, he makes up in quantity. His wells mark the trail of his career across North Wales, this is the seventh we have reported on, and many come with legends attached to the saint and his talent for restoring life to the newly slain. 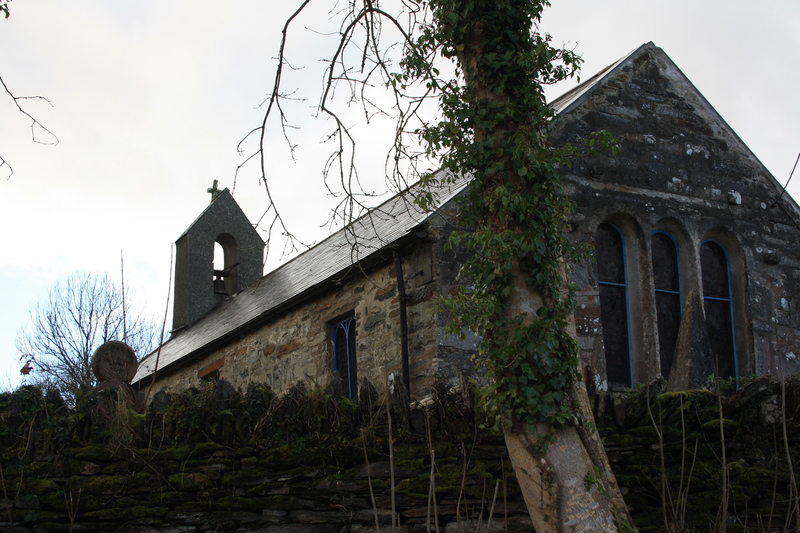 Alas, Ffynnon Beuno at Penmorfa fails also to provide a decent story. Beuno’s church here is a gem, much dating from the 15th and 16th centuries it is in the capable hands of the Friends of Friendless Churches charity who appear to have undertaken recent restoration and repair to the woodwork around the windows. 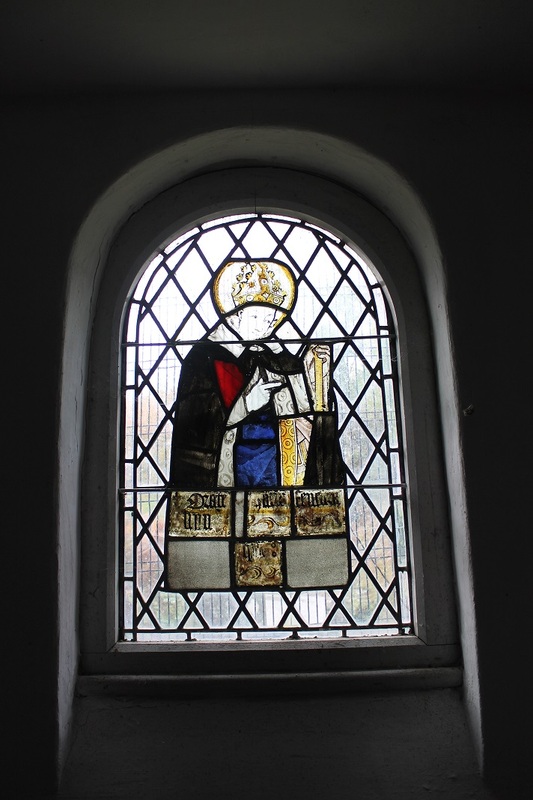 One window contains fragments of ancient stained glass which purports to represent Beuno himself; indeed the image is used to illustrate the article on Beuno in Baring Gould and Fisher’s Lives of the British Saints. However, there is no definitive identification, and it has also been suggested that it might actually represent St. Deiniol! The well lay in the garden of a house some 500 yards away from the church. It is recorded as far back as 1585.in a document referring to “maes ffynnon veyno”. The house still bears the name Ffynnon Beuno has appeared on maps since the nineteenth century. From an local account recorded in 1987 by Eirlys and Ken Lloyd Gruffydd the well was destroyed in around 1980, their informant suggested it was done to create more parking space. 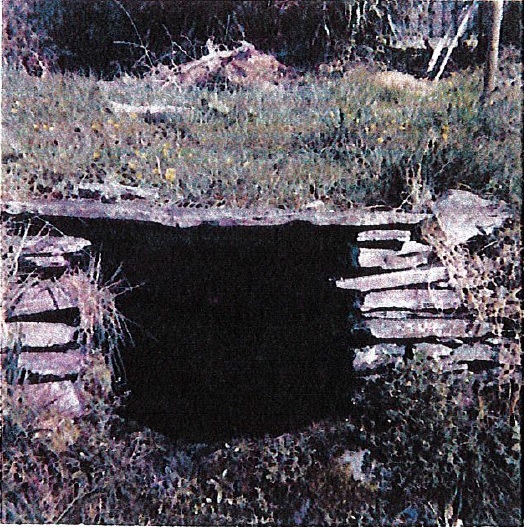 The only description of the well I have seen was also recorded in 1987 by the Gruffydds from local residents who remembered that the well was around three and a half feet wide and set into a bank. It had blue slate at the bottom which was taken out for cleaning. The landscape around the cottage has changed considerably, it would appear that the bank into which the well was set was removed at the time of the clearance work in 1980, such that today there is absolutely nothing left to be seen of where the well might once have stood. The house too has changed hands several times since then. I am deeply indebted to the lady we met nearby for a very interesting discussion and for providing a copy of the images below. 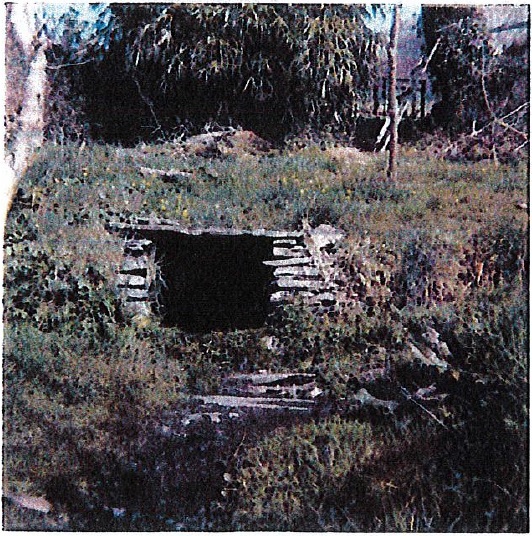 We can’t say for certain that this is actually a picture of the lost Ffynnon Beuno., maybe it is just another similar well that has been used as an illustration being indicative of what Ffynnon Beuno might have looked like. However the image provided was appended to a brief account left by someone who remembered the house and well and had been interested in its story. The image fits very well to the description given to the Gruffydds in 1987, and so it just might be one of the only remaining pictures of Ffynnon Beuno at Penmorfa. Eirlys and Ken Lloyd Gruffydd (1999) Ffynhonnau Cymru. Cyf. 2. Carreg Gwalch, Llanrwst. I forgot to take a photograph of the stained glass, and so until I return and rectify that I acknowledge the use a copy of a picture obtained from Wikimedia Commons attributed to Llewelyn2000 and taken in 2015. Thankyou for that wonderful story,its wonderful to know there are people like yourself trying your best to preserve our wonderful history.Many thanks,keep up the good work. Peninsula. Rings a bell with me. A map of all these wells of different periods would be really interesting and pictorially offer a different perspective especially if rivers, villages, and other archaeological evidence could be added. Are maps available? It would be an interesting contemporary project artists or mapmakers might find interesting. I’m intrigued by St. Beuno’s reputation for restoring life to the recently slain. What source does this come from and what evidence is there for this? It sort of gets to the crux of holy phenomena. Slain implies a battle and involving a sword or nasty implement. It begs the question about the state of medical knowledge at the time and if the person was dead or unconscious. Either way restorative powers would have required a conscious connection or knowledge about trauma, life, death, and some sort of practices or prayer. Is there any documentation of these events and their outcomes? Were these saints also the medicine men? I think that is the problem – these events happened so long ago so that there are virtually no records of the time. Most of what we get about Beuno and his life restoring powers come from the lives of the saints written 5 or 600 years after the event. They are clearly not historical accounts, but traditions passed down and written to support the devotes of the particular saint. Beuno’s most well known story is clearly associated with St Winefride (Gwenffrewi) and her decapitation which lead to the establishment of the well at Holywell. He is though, in many ways, unique as there are about half a dozen further accounts of him performing similar deeds. Whether this is just other communities wanting a bit of Holywell’s fame and money, or corruptions of a single story or a more general theme I don’t know. Still most saints didn’t do this, there are very few other accounts surviving of saints bringing people back to life as Beuno did – so maybe he did have particular medicinal expertise – as you say, knowledge of the definition of death was weak, but for those with heads cut off I suspect it is more certain. Although it varies much from saint to saint, there is an idea that they were not just there to preach Christianity, but had knowledge, be ad visors, healers, foretell the future and whatever else was needed. I agree some thematic maps of particular saints would be useful – although with many wells we have no information on age, or the times at which it was in use to produce maps for specific time periods.. I’m not aware of any – some geological maps show wells and other water courses (overground and underground) – though I would be interested in developing more thematic maps at some stage.